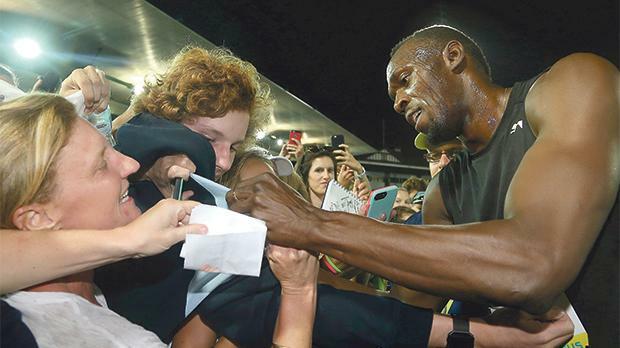 Usain Bolt signs autographs to his fans during the Nitro Serieas in Melbourne, yesterday. The Nitro Series promised to make athletics a show and the sport’s ultimate show-man Usain Bolt capped its first meeting in Melbourne yesterday by propelling his team of international “All-Stars” to a crowd-pleasing win in the 4x100 metres relay. Taking the baton from Olympic gold medal-winning team mate Asafa Powell, Jamaican Bolt powered down the second leg at Lakeside Stadium before Americans Jenna Prandini and Jeneba Tarmoh completed the win in the mixed team event ahead of Japan and Australia. Bolt’s first run of the year and first in Australia brought the curtain down on opening night of the Series, which has pledged to “revolutionise” athletics with a team-based event that borrows heavily from the formula of sport and entertainment which has underpinned Twenty20 cricket’s considerable success. With athletics struggling to maintain a profile outside of the Olympics and rocked by major doping and corruption scandals in recent years, organisers hope the series can reinvigorate the sport by shaking up the traditional schedule of events – and sprinkling some star-dust from marquee man Bolt. Bolt, who completed a “treble treble” of 100m, 200m and 4x100m relay Olympic titles at the 2016 Rio Games, was paid a seven-figure appearance fee to commit to all three meetings in the inaugural series in Melbourne this month and given a stake in the company running the event. He fulfilled his role as athletics’ great entertainer, galloping on to the field before the meeting as flame cannons shot fireballs into the air and dancing to thumping pop music. “Tonight is the first night, we just want to do something different,” Bolt said. “I’ve never handed (a baton) over to a girl. For me that was exciting. Bolt’s appearance helped secure a clutch of big names for the event, with American former Olympic 400m hurdles champion Kerron Clement running in his All-Stars team who won the overall event ahead of Australia. Christine Ohuruogu, the 2008 Olympic 400m champion, captained Team England. With mixed team events, a 2x300m relay and an elimination mile in which runners were knocked out progressively, the meeting carried on with troupes of dancers gyrating to electronic music in front of an enthusiastic crowd of about 7,000.